Emerging Strategies = "The Cutting Edge of Strategic Learning, Innovation and Resource Development to Accelerate the Ministry of Turning Lost Students into Christ-Centered Laborers"
OVERVIEW: The Essentials of Spiritual Growth and Multiplication has now become a proven tool that has been used effectively in multiple contexts. The purpose of the Assessment and Expansion Project is to fine tune the resource itself (assessment) and then seek to significantly increase its worldwide usage (expansion). We have completed the first eight lessons. I have about 75 staff around the country being beta testers. The initial feedback is very encouraging! Even the high school students using them as they disciple their peers have communicated their excitement. Have you made intensive efforts towards spiritual growth and multiplication with limited results? We have observed that the lack of success is not due to a lack of effort. The secret is to make it easy. Steve Douglass, Campus Crusade President, invested significant personal time to help us craft a single innovative resource that encapsulates many of the best practices seen globally. Essentials is very unique. It is not like other discipleship resources. Since 2005, hundreds of field staff and students have wrestled with the Essentials content resulting in significant modifications. It has been revised over and over again, maximized to the point where you will quickly see your small group participants experience, first-hand, the core DNA of Win, Build, and Send. It is new, yet you can have complete confidence in proven results. I guarantee that you and other small group leaders will easily grasp the Essentials strategy in this intuitive framework. 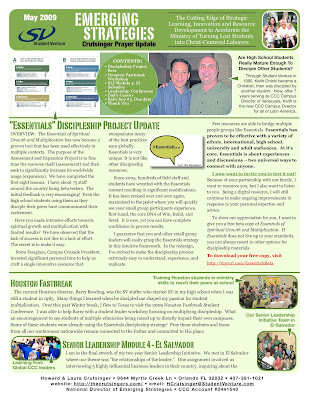 In the redesign, I’ve strived to make the discipleship process extremely easy to understand, experience, and replicate. Few resources are able to bridge multiple people groups like Essentials. Essentials has proven to be effective with a variety of ethnic, international, high school, university and adult audiences. At it’s core, Essentials is about experiences and discussions – two universal ways to connect with anyone. I now want to invite you to test it out! Because of your partnership with our family, I want to resource you, but I also want to listen to you. Being a digital resource, I will still continue to make ongoing improvements in response to your personal expertise and advice. To show our appreciation for you, I want to give you a free beta copy of Essentials of Spiritual Growth and Multiplication. If Essentials does not live up to your standards, you can always resort to other options for discipleship materials. The current Houston director, Barry Bowling, was the SV staffer who started SV in my high school when I was still a student in 1985. Many things I learned when he discipled me shaped my passion for student multiplication. Over this past Winter break, I flew to Texas to visit the 2009 Houston Fastbreak Student Conference. I was able to help Barry with a student leader workshop focusing on multiplying discipleship. What an encouragement to see students of multiple ethnicities being raised up to directly impact their own campuses. Some of these students were already using the Essentials discipleship strategy! Pray these students and those from all our conferences nationwide remain connected to the Father and committed to His plans. What percentage of your time are you working IN your organization, and what percentage of your time are you working ON it? In our National Team role, we find that in order to build Student Venture into a stronger and healthier ministry for the long run, we need to pull back from being immersed in the work that needs to be done. We have the responsibility to make whatever necessary changes organizationally to accomplish our mission through short term and long term strategies. 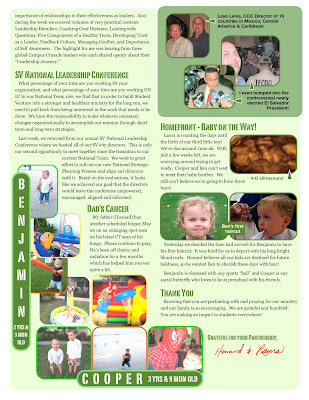 Last week, we returned from our annual SV National Leadership Conference where we hosted all of our SV city directors. This is only our second opportunity to meet together since the transition to our current National Team. We went to great effort to roll out our new National Strategic Planning Process and align our directors with it. Based on the evaluations, it looks like we achieved our goal that the directors would leave the conference empowered, encouraged, aligned and informed. My father (Howard) has another scheduled biopsy May 20 on an enlarging spot seen on his latest CT scan of his lungs. Please continue to pray. He’s been off chemo and radiation for a few months which has helped him recover quite a bit. Homefront - Baby on the Way! Laura is counting the days until the birth of our third little boy! We’re due around June 26. With just a few weeks left, we are scurrying around trying to get ready. Cooper and Ben can’t wait to meet their baby brother. We still can’t believe we’re going to have three boys! Yesterday we decided the time had arrived for Benjamin to have his first haircut. It was hard for us to depart with his long bright blond curls. Howard believes all our kids are destined for future baldness, so he wanted Ben to cherish these days with hair! Benjamin is obsessed with any sports “ball” and Cooper is our social butterfly who loves to be at preschool with his friends. Knowing that you are partnering with and praying for our ministry and our family is so encouraging. We are grateful and humbled. You are making an impact in students everywhere! Our staff always enjoy sharing the Gospel and seeing students come to Christ. It is doubly enjoyable to see the “student chain” which results when students share Christ with students who share Christ with students, and so on. The story below is just such a chain: one student led a friend to Christ, who led a friend to Christ, who led... That’s the core of Win-Build-Send! When Christ awakens a heart, other hearts are awakened and new souls enter into the family of God. Thank you for helping bring those souls into the family! On April 22, we held a Newman Smith HS, student-led volleyball outreach! We partnered with Prince of Peace Lutheran to provide the food, and with First Baptist for the volleyball courts. About 100 students attended the event and had great fun, met new friends, ate hot dogs, chips, chili, drinks and dessert for FREE, and best of all, heard the Gospel from their peers. Six students indicated they had placed their faith and trust in Christ for the forgiveness of their sins, and several others requested more information or want to get involved with Student Venture! Marvin and Jose, although nervous beforehand, spoke calmly, boldly and clearly when sharing their testimony in Christ. Marvin became a Christian 15 months ago at our Fastbreak conference as a result of his friend and SV student leader, Jordan. Jordan became a Christian through the influence of his friend and SV student leader RJ. RJ became a Christian through the influence of his friend and SV student leader Jared, who was discipled in 2001 by Howard Crutsinger. Marvin is continuing the spiritual multiplication chain as he invited Jose to our Fastbreak conference three months ago, and Jose gave his life to Christ! The change in their lives are evident to their friends, and both he and Marvin are currently in a SV Bible study, and are getting their friends to go with them to the summer conference in June.